I'm always advising people to switch providers when they spot a better deal on their household bills. Whether it's electricity or gas (with lots of different options to choose from) or health insurance with only three competitors, it's invariably true that just sticking with the same company year in, year out means you lose out. However, when you do switch, you'll often find that the best deals on offer require you signing up to a one or even two-year contract. When you do, it's easy to forget the end date and simply let it roll over, or disregard the fact there's often a charge for backing out of the contract. 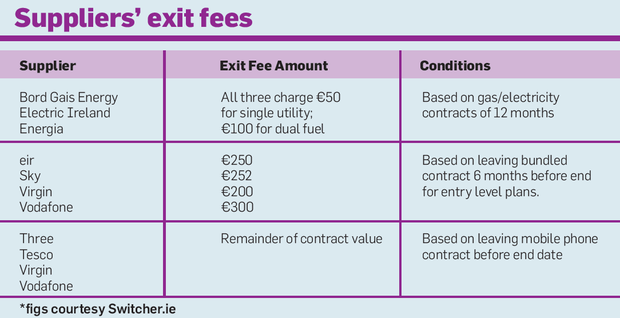 So-called 'exit fees' have become commonplace as utility providers attempt to shore up the customers they have and stop them switching to someone else. They can be very hefty too, sometimes running to the equivalent of several months of charges just to be allowed go elsewhere. Comparison website Switcher.ie has done some research into exit fees, which often form the basis of complaints to industry regulators from disgruntled customers who claim they weren't informed of them (they probably were, but they're tucked into the terms and conditions deep in the paperwork and can be hard to spot or interpret). Two thirds of gas and electricity or broadband customers, for example, weren't aware there was a penalty at all for leaving the contract early. As the average termination payment is €180, it can wipe out any bonus you're getting elsewhere for moving. There are breakout charges for television, bin collection and mobile phone contracts too, not to mention fixed rate mortgages, and because we're relatively poor at switching anyway, it's not something you think about. Some industries are better than others about warning customers. Energy suppliers are the most open, with penalties clearly displayed on websites, or a flat fee being charged instead of several months' direct debits. The Regulator has also insisted that from this month, all gas and electricity suppliers give 30 days' notice to customers when they are coming to the end of their contract. That allows them a bit of time to look elsewhere. Insurance companies are already obliged to do this and at least it's fair warning to shop around. Consumer law states all contracts must have a 14 day minimum 'cooling off' or change-of-mind period. Telecoms companies are lagging behind, says Switcher.ie. "It can be difficult to find the information on some providers' websites and charges for cancelling contracts tend to be higher, too, reaching up to €300 for someone who cancels their contract with six months remaining," says Managing Director Eoin Clarke. "Unlike most energy deals, broadband, television and phone plans often come with equipment such as set-top boxes, modems and handsets included, so this could explain the higher charges. It's also worth noting that early exit fees are waived in certain circumstances." In some cases, the fees are warranted. For instance, if you get the latest iPhone 7 free in exchange for signing up to €50 a month, well it makes sense that if you cut and run, you're going to be charged for a handset worth €700. The only time you won't be charged exit fees in-contract is if the company changes the terms and conditions before your time is up, for example, by increasing a monthly amount. If they do this, you have the right to exit the contract and move elsewhere without penalty. The table shows some of the typical conditions involved when you break your contract, so it is definitely worth asking the question before you sign up. Sinead Ryan I had to make a last-minute trip abroad last week, just over and back quickly. I knew it would be more expensive than if I had the luxury of booking well in advance, but it was still a shock. Sinead Ryan If only we'd known summer 2018 was going to be so nice, we could have saved loads of money on booking foreign holidays. Sinead Ryan Getting on the road is harder than ever for young drivers. Whether it's the cost of insurance - which is set to rise with yet another levy - or trying to find a car you can afford, along with tax, NCT, servicing costs and rising fuel prices, it can be tempting to punt for an online 'bargain' or an import from the UK.